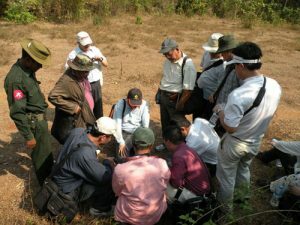 From March 3 to 13, HydroChina ZhongNan Hutgyi PMO, SinoHydro International Engineering Co., Ltd., SinoHydro Foundation Engineering Co., Ltd., Electricity Generating Authority of Thailand (EGAT), and Myanmar IGE Co., Ltd. jointly carried out a field survey for Hutgyi Hydropower Project in Myanmar. Interest by PRC companies in building dams and generating stations along the Salween (Thanlwin) river in Burma continues to grow. YANGON, Apr. 25, 2010 (Xinhua News Agency) — Four companies will jointly implement a hydropower project originally agreed between the electric power authorities of Myanmar and Thailand four years ago, according to a state-run daily Sunday. The Hutgyi hydropower project will be implemented under a memorandum of agreement signed on Saturday in Nay Pyi Taw among the Department of Hydropower Planning of the Myanmar Ministry of Electric Power-1, Sinohydro Corporation Ltd of China, EGAT International Co Ltd of Thailand and International Group of Entrepreneur Co Ltd, said the New Light of Myanmar. Experts of Myanmar and Thailand have made initial survey on some river ports along Myanmar’s Thanlwin River in preparation to build the hydropower plant already agreed in December 2005 between Myanmar and Thailand. Soil tests on banks of some three ports along the river in southeastern Kayin state were carried out then by experts of Myanmar and the Electricity Generating Authority of Thailand (EGAT) to build the Hutgyi hydropower plant under an agreement signed in December 2005. The Hutgyi hydropower plant will consist of a 600 megawatt (mw) turbine that can produce 3.82 billion kilowatt hours (kwh) yearly, according to earlier report. The project constitutes part of those on the Thanlwin and Tanintharyi Rivers agreed earlier between Myanmar and Thailand in June 2005. Chinese admissions about the extent of a severe drought in its southwest Yunnan Province bordering Burma coincide with an announcement that a Chinese-led consortium is beginning work a huge hydroelectric dam on the Salween River. Dams built on major rivers running through Yunnan are being blamed for contributing to the current drought and the lowest water levels along the Mekong River for many years. Three state-owned Chinese firms will work on the US $9 billion 7,100 megawatt capacity dam at Tasang on the Salween, confirmed the Chinese State Asset Supervision and Administration Commission. The firms are China Three Gorges Corporation, Sinohydro Corporation and China Southern Power Grid. The inclusion of China Southern Power Grid indicates that China is aiming to develop an infrastructure to transmit most of the electricity generated from the project into Yunnan. Three Gorges Corporation manages one of the world’s biggest hydroelectric projects, of the same name, on the River Yangtze in China—and is blamed for major environmental problems. Burma has virtually no electricity grid outside of a narrow corridor between Rangoon and Mandalay and its generating capacity is barely 25 percent of the planned Tasang’s capacity. The Tasang dam is going ahead despite warnings from environmentalists that it will be ecologically damaging for Burma—and could lead to water shortages downstream. China’s central government has ordered a halt to some hydro dam project in Yunnan because of ecological concerns. “Our neighbors’ governments … should follow their own standards in Burma as well,” said the NGO Burma Rivers Network. At a ceremony to “lengthen the life of the Salween”, hundreds of environmentalists and local villagers along the Salween from both Thailand and Burma gathered to continue protesting against any dam projects on the Salween basin, on 14 March, the International Day of Action Against Dams. On 13-14 March, many nongovernmental groups, civil society groups, environmentalists from Thailand and Burma including Salween Watch and the Burma Rivers Network, held a traditional ceremony praying prolonged life of the Salween for all living things to be able to rely on it forever. It also called for unity to protect the river.